On 16 November 2016, the Board convened in Brussels for the third Board meeting of the year. Discussions centred on the future of the European Union, developments on trade policy and on European labour mobility. We had the honour to welcome Mrs Marie-Hélène Ska, Secretary General of Belgian Christian trade union ACV-CSC, to the Board meeting as keynote speaker. Mrs Ska reported on the activities and European priorities of ACV-CSC and stressed the crucial importance of civil society organisations, including trade unions, in mediating the relation citizens and politics. Second, the meeting continued with a report by President Elmar Brok on recent developments regarding the future of Europe. The President stressed the feeling of insecurity, both in the area of the economy, the social situation and security and stressed the crucial need for positive politics and concrete results to be delivered by democratic forces in order to counter populism. He also called upon elected politicians to take up their responsibility in a framework of politics as vocation. Third, the Board discussed work in progress regarding. 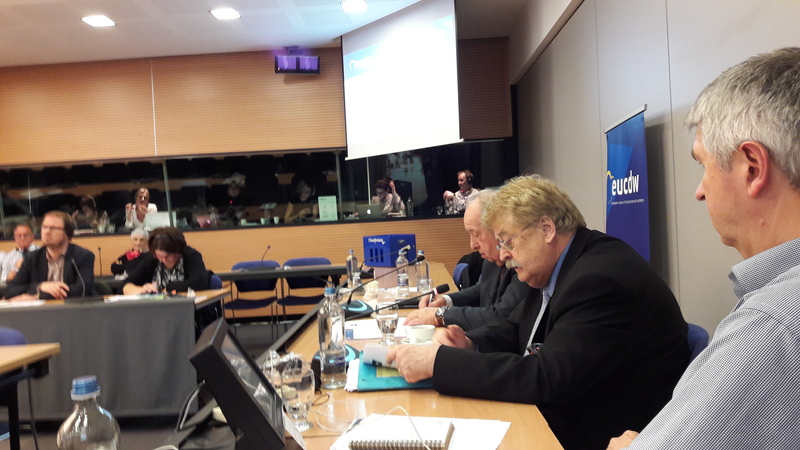 In particular, work was finalised on the EUCDW Position Paper on TTIP and a work was started on an EUCDW Position Paper on Fair Labour Mobility. The Board also discussed input to the public consultation by the European Commission on the proposal for an EU Pillar of Social Rights. Fourth, the Board started preparations for the EPP Congress in Malta on 29-30 March 2017.